If you are self-studying for GATE then you can create a disciplined plan to complete it successfully. Many who are trying it for the first time shall feel it quite intimidating. There is a way out of this confusion and that is what this post is about.Preparing for GATE without coaching and devoting only on self-study gives you absolute control over your schedules, consistence and most importantly time. Here are some GATE Preparations tips and how to create a fool-proof GATE self study plan. If you are sincere then you will plan all the above three efficiently. Before that lets see what are the core factors required here. Here are some core factors while Preparing for GATE. “Practice makes man perfect.” Always revise the content that you studied. For best results, your GATE self study plan must be scheduled atleast before four months of the exam. Every paper covers more than 10 subjects in GATE and so one or two months is not sufficient.If you only allot one or two months then let me say you will never be able to figure out how to study for GATE and complete the entire portion and it is practically quite impossible. Prepare for Mathematics and General Aptitude on the same level of Technical. Remember to complete Mathematics and General Aptitude. These carry 30% ratio of total marks. Previous years papers shall guide you to analyze GATE exam but not to success. You have to do more study other than previous years papers. A good starting will have a successful completion at the end. Begin your preparation with known subject where you have good knowledge on it. Use your study time only for preparing relevant topics of GATE syllabus and not for preparing the whole book. Don’t waste your time in subjects that you don’t know much about. You need to organise and plan your GATE self study schedule subject wise, considering those tough and easy topics. You need know the concepts of a difficult subject in order to prepare. It is better if you choose a subject that is medium difficulty for you and is also an important subject in GATE. Don’t start the preparation with a tough subject. Also, studying a very easy subject means you waste lot of time on it in the beginning, which is plain foolish. Check out Opportunities after GATE Exam. Time is the only thing in your hands and first you should allot enough time to study for the GATE exam. . Students will have to do accurate analysis of the GATE syllabus. For instance find the subjects, topics in each subject and select the order of subjects for preparation.Here are some 5 top tips to improve your performance during gate exams. Always build a timetable to finish studying for each subject in a day. Be good in all subjects than mastering just one subject. Use the time while travelling to prepare for GATE or for browsing and finding high quality information. Monitor your daily activities sincerely. Use time to complete useful discussions with competitive group of friends. Quit – watching TV, irrelevant internet browsing and chatting. Each person’s preparation time varies slightly. Now say you have already prepared all the subjects during the previous GATE Exam, then you can still use 2 to 3 hours for revising and practice. Use minimum 5 to 6 hours for GATE preparation if you want to be a topper. In case you are preparing the GATE exam for the first time, then you must definitely use more energy and hours in order to understand the study pattern and syllabus. Some exams you can use one book to the maximum. For GATE exam, the syllabus might be in such a manner that for a few subjects all the topics may not be present in one text book.Sometimes this one book may not have enough information about a particular subject.Therefore, use two books to cover all the important topics and information. Always buy and use books with good standards and quality. Don’t- Choose just one book. Don’t: Buy or use bad quality books. A little mistake can lower your GATE rank. These are of three kinds like standard books, institute and online resources.In good coaching institute materials, there is content that is related to your syllabus. This might help you but this might not be enough.Textbooks have lot of information use it when you have lot of time. Online resources have lot of material, hence choose relevant high quality material. Use their quizzes and other preparatory material available to help you practice regularly. Not everyone needs the help of a coaching institute for GATE preparation.You can self-study if you use the above plan wisely using the correct study material.Sometimes you might need a guide to study when you have no clue, and for that you can still join a GATE coaching institute. Here are some tips to choose the best GATE coaching center in Kerala. Besides that you can always check out online communities and blogs when you can’t join a institute.Use Facebook, Quora, google, Gradestack etc. to find good experts to discuss and get guidance regularly.Join the GATE self study communities where you can discuss on techniques and doubts while preparing for the GATE. Hope you found this post about how to self study effectively for the GATE really useful. One of the aspects in GATE self study preparation is about acquiring enough clarity on the fundamental concepts of your graduation courses. Proper practice certainly develops overall performance potential during the actual examination. Anyone can become one of the toppers in GATE if they wish to. Also Read how to crack gate exam in first attempt. 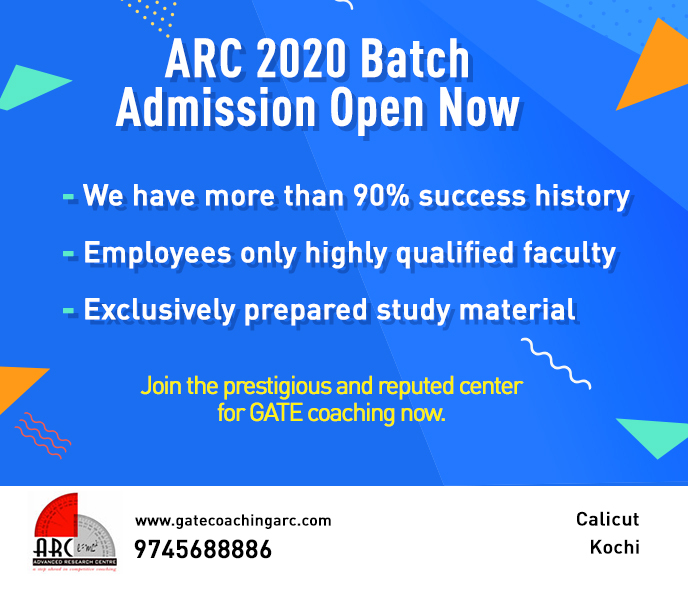 Enroll today to one of the best GATE coaching institutes in Kerala where you will get all innovative techniques and knowledge resources to compete with the finest brains from all over. Send in a query to our contact form and our team will quickly get back to you.